Since 2013, the Changing the Face of Philanthropy Summit has convened more than 200 of the nation’s most trailblazing young black leaders, and philanthropists with undoubtedly some of the most influential organizations in the public and private sectors. Together our attendees, and partners cultivate relationships, strengthen skill sets and develop action steps needed to help solve our communities more pressing issues. CFP is the only conference intentionally seeking to fortify the philanthropic giving, community engagement and effective leadership of today’s next generation of black leaders. Through targeted plenaries, compelling speakers and meaningful networking, attendees leave year after year with tactics suited for effective community work. Why do we host CFP? We host CFP to connect young, black philanthropists, non-profit founders, board members, volunteers and activists from across the country with the goal of increasing collective impact and building a network of support. Our own research shows that in 2014, 92% of our network donated financially to a nonprofit. The Community Circles report of Connected to Good reveals, “More than one in five African American donors (21%) have participated in giving circles…These are higher rates than among both Jewish donors (14%) and white non-Jewish donors (10%). A particularly striking finding was the age of giving circle participants. Unlike other aspects of charitable giving, giving circle participation is much more strongly related to age than to income: nearly half of all participants are under 40.” Continually, the 2015 Diversity of Giving report by Blackbaud states that "The underrepresentation of African-Americans and Hispanics suggests that organized philanthropy is not doing an adequate job of engaging non-white communities." As such, The Young, Black and Giving Back Institute is doing what organized philanthropy is not; we are creating a space and investing in the tools and resources nextgen black civic leaders can use to be the best changemakers they can be. We can't truly do this work without understanding the policy that directly influences the change we want to see. Leave more confident and informed about policy and how to be involved. An interactive session on the importance of strengthening mental, spiritual and emotional Well-being in the movement. Tapping into funding sources for today's movement isn't easy. Learn which organizations are supporting this work and how to maximize the support. For centuries giving in the black community has occurred in a number of ways that are not recognized as traditional philanthropy. Yet, many of these giving strategies have kept our communities thriving. In this plenary discover how individuals and organizations have translated the giving behaviors native to our communities into larger sustainable models and how you can do the same. Funding is hands-down the hardest part of starting a new business or non-profit. This is even more so for founders of color. Learn from the Johns Hopkins Social Innovation Lab what you need to know to get the best funding possible using the resources available to everyone. The 2016 Changing the Face of Philanthropy Summit will take place at the offices of the United Way of the National Capital Area, conveniently located blocks away from The White House and The National Mall. We thank our partners at the United Way NCA for their continued support of our work and the CFP Summit. Wells Fargo Advisor's Community Affairs' vision is to help its communities succeed financially. Its mission is to advance greater opportunity, economic prosperity and enhanced quality of life for everyone. Nationally in 2015, Wells Fargo donated $281.3 million in grants to 16,300 nonprofits, including affordable housing, foreclosure prevention and counseling, financial literacy, and workforce development programs. This is the second year Wells Fargo Advisors has been a partner for CFP. We are grateful for their support and investment. The United Way of the National Capital Area works to help members of our community to have a better life. It convenes the people and organizations necessary to create solutions to its region's most pressing challenges. UWNCA collaborates with effective partners and serces as the catalyst for community change. UWNCA brings together the voices, expertise and resources needed to define, articulate and create community impact in the national capital area. CFP is thrilled to have UWNCA back as a venue sponsor and a financial partner for the first time. The Social Innovation Lab at Johns Hopkins is an early-stage incubator for innovative nonprofits, mission-driven companies, and disruptive technologies and inventions that seek to tackle pressing social issues in Baltimore and beyond. We welcome the Lab to our YBGB family and thank them for investing in our work. We look forward to continued partnership opportunities with them. 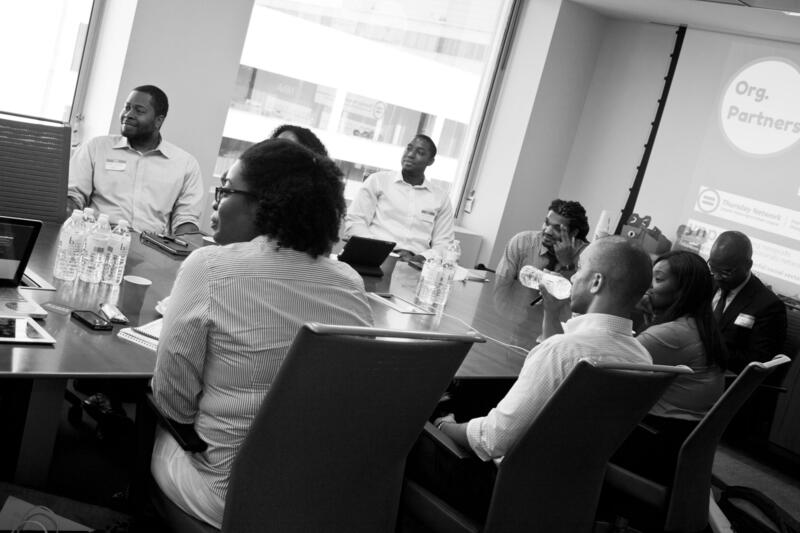 Formerly the education program of Friends of Ebonie, the mission of the Young, Black and Giving Back Institute is to equip, inspire, and empower young black professionals, influencers, social entrepreneurs, and activists to effectively invest in changing their communities through civic leadership and philanthropy. Is This Conference Considered Professional Development? Can My Company Send Me? Yes, this convening is personal AND professional development. For some there's a direct correlation to their jobs, for others, it may take some fancy wording to make the case. The Summit is designed to enrich, enhance and empower the philanthropic passions of black men and women between the ages of 25- 40. Whether you are an existing or aspiring philanthropist, board member, volunteer, community leader or non-profit founder, there is something for you at the Summit. I'm Traveling from Out of Town, where should I stay for The Summit? What should I wear to the Summit? Leave the stuffy suits at home. Feel free to wear your favorite “office-casual Friday” or business casual outfits. Yes, jeans are okay. Will the summit be live streamed? I purchased My registration but i'm no Longer able to attend. Can I get a refund? Due to the nature of the Summit, we are not able to offer refunds. However, we will allow registrants to submit an alternate to attend in their place. Please email: rsvp@friendsofebonie.com. Register & Connect with Us!